AMD Bulldozer / FX-8150 Processor Review Summary: Should You Buy One? The AMD FX line of processors based off Bulldozer has debuted with four products, ranging from the eight-core FX-8150 to the quad-core FX-4100. So far, review sites have only taken a look at the flagship FX-8150, most likely because that is all AMD has sent out to site for reviews. In this article, I'll summarize the reviews so far and provide you with a broad idea of how this new part perform. Most importantly of all, I'll help you answer the question you're no doubt asking – should I upgrade? Bulldozer was, from the beginning, a rather unusual design because it was based off an approach to computing that relies more on multi-threaded performance than any previous processor, including Intel's six-core, hyper-threaded Extreme Edition processor. 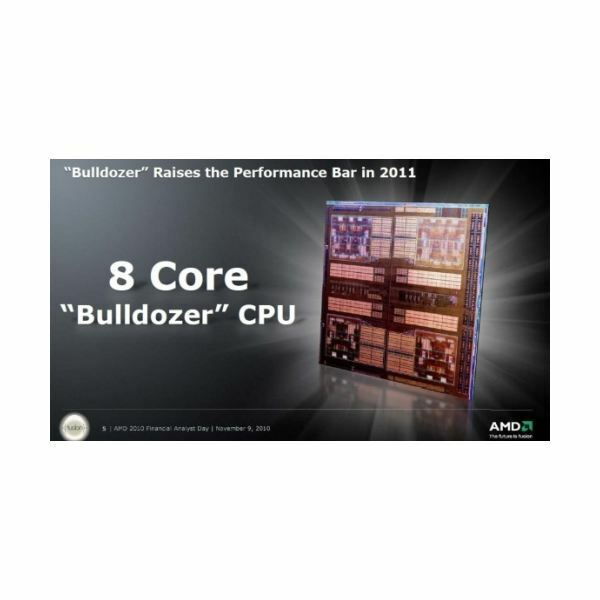 Bulldozer processors are constructed using what AMD calls modules, each of which consists of two integer cores and one floating point unit. As basic math would lead you to expect, AMD's eight-core FX-8150 contains four of these modules. Part of the problem with relying on multiple cores for performance is the increase in complexity that comes with managing data between the cores. Send data to the wrong core, at the wrong time, and you create a performance killing backup in the architecture. To attempt compensate for this, AMD has put a lot of work into the processor's branch prediction. Work has also been put in to the processor's memory, which features aggressive data prefetchers designed to keep the cache filled with the most appropriate data. In addition to the pursuit of multi-core performance, AMD has placed a greater focus on clock speeds. There's a new multi-stage turbo feature that includes normal and "max" turbo modes, with the max becoming possible only when half or fewer of the cores are being used. Even the base speeds are rather high. The FX-8150 ships with a base clock of 3.6 GHz, while the quad-core FX-4170 (not available at launch) will be shipping with a base clock of 4.2 GHz. Of course, none of this really means much to consumers. The question is simple – does this processor outperform Sandy Bridge, or at the very least, offer a compelling value? Because of the Bulldozer architecture's reliance on multiple cores, there is a clear potential for weakness in scenarios where a single thread is used. Although many modern software programs are multi-threaded, there are also many that aren't. Web browsers, for example, still generally make use of only a single thread. The FX-8150 doesn't just fail to outperform Sandy Bridge. It also fails to outperform previous Phenom II based processors from AMD. What this demonstrates is that single-threaded perform of Bulldozer is actually less impressive than that of Phenom II. In workloads such as this, you'd actually achieve better results with an older, less expensive product. Anandtech was able to replicate this using a single-threaded Cinebench R10 benchmark. In this scenario, the FX-8150 running at 3.6 GHz was not able to outperform a Phenom II X6 running at 3.3 GHz. Granted, the difference in score was less than 200 (4083 vs. 3938) but the fact that new FX-8150 failed to beat the Phenom II X6 in per-clock performance is disturbing. So far, AMD isn't off to a great start. Games have become an intriguing benchmark for modern processors because they tend to fall somewhere between the benchmarks that rely heavily on clock-speed and those that rely heavily on multi-threaded performance. Most games need a nice balance of these qualities to run well. As was demonstrated above, the single-thread performance of the new AMD FX processors is lacking. Perhaps this can be compensated for by flexing the power of eight cores? Let's start by having a look at The Tech Report's benchmark of Civilization V. The benchmark was run at 1920×1200 with all detail settings at high. In this game, the new Bulldozer processor does manage to pull ahead of its Phenom II based brethren – barely. The FX-8150 scored 32 FPS, while the Phenom II X6 1100T scored 30 FPS. But the Intel competition has a clear advantage. The Core i5-2500K, which is a little less expensive than the FX-8150, managed to offer an extra 11 frames per second. Anandtech received even worse results by running Dawn of War 2. As I can attest from my own experience, this game tends to rely more heavily on lightly threaded processor performance than some other titles. As a result, the FX-8150 comes in behind the Phenom II, and by no small margin. According to Anandtech, at a resolution of 1680×1050 at Ultra setting, the new Bulldozer scored 51.5 FPS – but the Phenom II X6 managed 61.1, and the Core i5-2500K managed 82.3. Perhaps the only decent result came from PC Perspective, which ran the FX-8150 in the Battlefield 3 at 1920×1080 with high detail settings. Under these conditions, the FX-8150 performed on par with Intel's Core i5 and i7. Of course, so did the Phenom II X6. What this benchmark shows is that for high-end gamers, the processor is still less important than the graphics card, because the most demanding games usually have their performance limited by the GPU long before the limits of the CPU are reached. So far, the FX-8150 hasn't done well, often times coming in behind the Phenom II. However, the benchmarks so far haven't given it a chance to flex its full multi-core might. What happens when you place this new processor in a scenario where it can perform to its maximum potential? PC Perspective tested this using the heavily threaded Handbrake application, where we see that the FX-8150 can easily outrun the Core i5-2500K. In fact, it nearly beats the more expensive Core i5-2600K. Let's check another benchmark to see if these results are more than a fluke. The Tech Report managed to replicate this in its 7-Zip benchmark, where the FX-8150 is again on par with the Core i7-2600K. It should be noted, however, that these benchmarks represent best-case scenarios. Most applications are not as favorable, including programs like Photoshop and even Cinebench. When Anandtech tested multi-thread performance in Cinebench, they found that the FX-8150 does manage to land between the Core i5-2500K and Core i7-2600K, but it also only barely outruns the older Phenom II X6. It's not always clear that Bulldozer is superior to Phenom II, even under ideal conditions. There's no way to escape the fact that AMD's new architecture is a huge disappointment. In single-threaded and light-threaded scenarios, Bulldozer often performs no better than the previous Phenom II architecture. As a result, it has a difficult time keeping up with Intel's Core i5-2500K, which is actually a less expensive processor than the AMD FX-8150. Sometimes, the FX-8150 can't even beat the basic Core i5-2400. There are a few workloads where Bulldozer has the chance to shine, and in these situations the processor can keep up with the Intel Core i7-2600K, a much more expensive processor. Yet these scenarios are few and far in-between, and certainly don't represent the kind of work a typical consumer will be doing with their computer. Gamers are also left with no benefit from this new processor – in some cases, upgrading from a Phenom II to the FX-8150 would actually result in a performance decrease. This may well be the last nail in the coffin for AMD's desktop processors. The company worked long and hard on this architecture, but the result is in many situations no better than the Phenom II, and still a long ways behind Intel's Sandy Bridge. AMD promises an update called Piledriver next year, but the performance upgrade is estimated to be only 10% to 15%, and by then Intel's next generation will be out. Even if you currently have a compatible motherboard that could accept an FX-8150 processor, it's not clear that you should upgrade. You may well receive better performance from your current processor, depending on how you use your computer. This is a disaster for AMD, and a huge disappointment for fans such as myself, who were waiting for Bulldozer in hopes that it would at least be somewhat competitive. It isn't, and you probably shouldn't buy it.